What The Latest Immigration Polls Do (And Don't) Say It can seem like there's a poll result that supports just about any position on any topic. Here's a look at what the latest immigration polls can and can't tell you. Demonstrators, many of them recent immigrants to America, protest the government shutdown and the lack of a deal on DACA (Deferred Action for Childhood Arrivals) outside of Federal Plaza in New York City on Monday. "Americans broadly embrace the Democratic immigration position," declared a Washington Post headline, with the release of a new ABC/Washington Post poll. On immigration, as on any other issue, it can seem that there's a poll result that supports just about any position. Here's a look at immigration polls to explain what findings are shaky — and to highlight what can reasonably be concluded about Americans' views on immigration. Deputy White House press secretary Hogan Gidley touted a Harvard Harris poll on Morning Edition Tuesday, saying that it showed Americans support the president's agenda. "It's an 80-percent issue, people want to close down the borders," he told NPR's Rachel Martin. "It's a 70-percent issue to end chain migration. [A] 68-percent issue to end the visa lottery program and ask people to come here on merit. That's a 70-percent issue. And this is a study from Harvard." First things first — there's a lot more to these poll numbers than Gidley is saying. That Harvard Harris poll didn't find that 8 in 10 Americans want to "close down the borders." Rather, it asked Americans, "Do you think we should have basically open borders or do you think we need secure borders?" Given the choice between "open borders" — a position that no mainstream political leaders are proposing — and a "secure border," which is current U.S. policy, 79 percent of Americans agreed that the U.S. needs "secure borders." It is true that 68 percent of Americans said they oppose "the lottery that randomly picks 50,000 people to enter the U.S. each year for greater diversity." And in fact, even more (79 percent) favored merit-based immigration over family-based migration, based on a question asking whether "immigration priority for those coming to the U.S. should be based on a person's ability to contribute to America as measured by their education and skills or based on a person having relatives in the U.S."
But then, that question provides an argument for using education and skills as a factor ("ability to contribute to America") but not for using family ties. That may have swayed respondents toward the merit-based choice. It's also possible that the question gave some respondents the idea of a false choice, said one immigration researcher. "It shouldn't have to be an either-or," said Randy Capps, director of research for U.S. programs at the Migration Policy Institute, a nonpartisan Washington, D.C.-based immigration think tank. It's possible, he added, for a system to incorporate both "merit" and family ties. "You can have both — you get more points for having higher education, you get more points for knowing English, you get more points for having a close relative," he said. "I think what they're saying here is merit should have more of a preference than relatives," said Mark Penn, codirector of the Harris Poll. "I don't think we polled a full battery of specific chain migration policy here. I would read this as saying that you see the public backing limits" on the idea of family-based immigration, he added. Right now, both family- and skills-based immigration exist in the U.S., though far more — around two-thirds — is based on family ties, according to Capps. Meanwhile, around 15 percent of admissions to the country are related to jobs and skills. On top of that, there are diversity visas, visas for investors who create jobs and allowances for refugees. The numbers shift heavily depending on how the question is asked, however. In a Morning Consult/Politico poll from August 2017, there was a question asking if there should be a "greater emphasis on an applicant's job skills over their ties to family members." Fifty-six percent either strongly or somewhat supported this, while 42 percent opposed it. That's still a majority who favor merit over family, but it's a smaller majority. That poll asked these questions still other ways, though. For example, when the poll separated out different potential factors, several had strong support. Fully 60 percent of Americans said that "ties to family members in the United States" "should be a factor" in determining who should get to legally immigrate to the U.S. The poll also found that 57 percent believe education should be a factor, and that 54 percent believe "professional or academic achievement" should factor in. In other words, when it's not presented as an either-or choice, Americans appear to have a more nuanced view on family-versus merit-based immigration. Americans' support on any given issue can jump around over time, and depending on when and how the questions are asked, the answers can be interpreted any number of ways. But based on an array of reputable polling, here are a few reasonable conclusions to draw. 1. Americans support letting DACA recipients stay. That latest poll from the Washington Post found that 87 percent of Americans support "a program that allows undocumented immigrants to stay in the United States if they arrived here as a child, completed high school or military service and have not been convicted of a serious crime." An NBC News/Survey Monkey poll released Tuesday likewise found that 66 percent of Americans support "the DACA (Deferred Action for Childhood Arrivals) policy, which protects those who were brought into the United States as undocumented children from being deported." 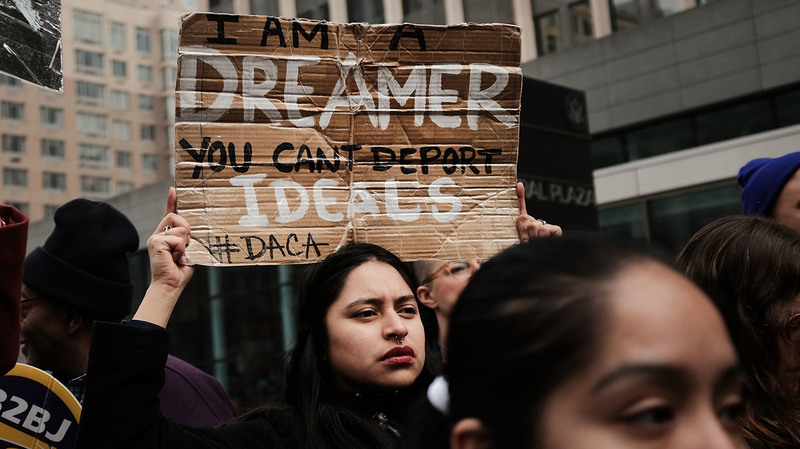 There's a more than 20-point gap there, but these two results do join months of poll findings showing that find that a majority of Americans support the idea behind DACA, allowing children brought to the U.S. illegally to stay in the U.S.
January polls from Quinnipiac, Pew, ABC News/Washington Post, CNN and CBS all find that around 6 in 10 Americans oppose building or expanding a wall along the U.S. border with Mexico. That said, all of those polls asked about building a "wall" specifically. But the definition of "wall" is fluid. While Trump has long advocated for a border wall, he has also said that in some places on the border, "natural barriers" would take the place of that kind of barrier. And Republican senators recently said that the "wall" would be more of a "fence." But that Harvard Harris poll didn't find such strong opposition to a border barrier. It found that 54 percent of Americans support "building a combination of physical and electronic barriers across the U.S.-Mexico border." It could be that some Americans oppose a "wall" but believe in using a mix of resources as border barriers. It could also simply be that the word "wall" is at this point so politicized that some Americans instinctively oppose it while still wanting more of a barrier at the border. 3. Americans are divided on legal immigration levels, but are more in favor of decreasing than increasing them. For decades, Gallup has asked Americans if they think the level of legal immigration should be "kept at its present level, increased, or decreased." In recent years, Americans have been closely split between holding steady (38 percent as of June 2017) and decreasing (35 percent). The remainder, around 1 in 4, want to increase legal immigration. While the clear majority want to decrease or hold legal immigration steady, these numbers represent a longer-term pro-immigration shift — as of the mid-1990s, two-thirds of Americans wanted to decrease legal immigration, and only 6 or 7 percent wanted to increase it. The Politico/Morning Consult poll asked it a different way, asking how they'd feel about halving the number of legal immigrants over the next 10 years. It didn't offer the option for holding it steady, just varying degrees of support or oppose. Nearly half, 48 percent, strongly or somewhat supported cutting legal immigration in this way; 39 percent opposed it (the rest didn't know or had no opinion). Once again, there's no majority here, but more people wanted to cut legal immigration than grow it. The Harvard Harris poll tried the question yet another way: "In your opinion, about how many legal immigrants should be admitted to the U.S. each year?" It then provided a series of choices: zero to fewer than 250,000, 250,000 to 499,999 and so on up to 2.5 million or more. It's hard to know how to interpret the results of that question without the context of current immigration levels. As of 2016, the U.S. accepted nearly 1.2 million new legal permanent residents, according to the Department of Homeland Security. Of those, just over half were new arrivals. The rest of people received changes in status — for example, some might have been refugees who became legal permanent residents. The poll found that 72 percent of people chose some number under 1 million, which might suggest that those people want to reduce legal immigration. But then, the question didn't provide them with current immigration levels. There was no way for many of them to know what direction they were arguing for immigration to move in. As a result, this is one way that this poll's results may have been misleading.